Once upon a time, there was a good for nothing fella. He refused to move a muscle or make an effort to do anything with his life. Yet, his mother doted on him. 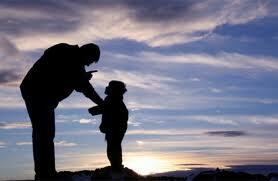 However, his father was worried for his future and tried to drill some sense into the boy’s head, but to no avail. One day, out of sheer desperation, the father challenged the boy to earn a rupee. The boy couldn’t care less, but the mother could not bear to see the apple of her eye fall in his father’s eyes. She gave him the rupee. The son took the coin to his father who asked him to throw it in the well in the courtyard. The son complied. This went on for a few days. Mother gave the coin. Son took it to the father. Father asked for it to be thrown in the well. This was a story my father told me when I was little. It has stayed back with me among many other things. My parents set us examples to follow. They simply did not preach. What we could not afford stayed in the realm of not available. Even as I grew up, I knew my limits. My father did not drink or smoke. I was never tempted to try it out either. I remain a teetotaller till date. I have nothing against those who do. The point I am trying to drive home is, you can’t navigate the ship by staying ashore. Children might have idols they look up to, but they land up emulating their parents, most of the time. Present day parents, me included, are faced with peer pressure far more than our parents were. Times are different. Yet, we succumb so easily. Just because we saw the turn of the new millennium don’t mean the one that went by was devoid of any challenges. Our parents had their own set of issues to deal with. And somehow they managed. My grouse with the present day generation is we look for replacements, so easily. And when we do, we hide the fact that we fell for the short cut. I know so many parents who don’t advocate cell phones. Our kids are only pre-teens. And yet, on the sly, they have handed their kids handsets. But talk about the ill use of the gadget and you can hear them the loudest. That brings me to another thing my father taught me. “If you need to hide it from the world, that means it ain’t right. If you think you are right, you would not care what the world makes of it.” Words of wisdom from our bucket of experiences is the only legacy we leave behind. Make it a treasure trove for the next generation. Learn to say a ‘no’ every once in a while and mean a ‘yes’ when you promise. Chances are that these lessons will be regaled as stories to your grand kids. Parents, live that example today…. A very wise dad – so right, our children emulate everything we do. Loved your post. Precisely! – I cannot agree more with you Gee – Very well put! No matter what we preach, our kids only learn from what they see us doing. We were fortunate to be taught well, Laxmi. I guess we have a lot to be grateful for. A very nice post. Indeed kids emulate their parents and learn from their actions far more than their words. Totally. So then why do we complain? Wonderful post Vini…and I so love your dad. There’s way too much pressure on parents today from their children and other parents. I see loads of children on FB which has an above 18 policy (if I’m not wrong). Are we encouraging children to lie about their age to be with it? I’m glad when parents talk about these issues – because if I do, I’m told, what do you know, you have no kids! True BG,we do end up emulating our parents.My father still tells me stories when he has to drive home a point.My kids are more than amused to see me lap up those stories eagerly.Touched a chord somewhere..your narration.Beautiful and warm as always. I know what you mean. Treasure it Sharmila……. You are bang on B. Our parents are our first role models, we learn the most from them, so setting the right example is so very important for parents and doing so in today’s times is indeed tough. Wonderful examples to learn from. Shilpa, if we only concentrate on our footsteps rather than someone else’s path, we should do ok, me thinks. Being an example beats any other form of lesson. Wonderful post. Thanks Shail. And we are an example, whether we like it or not. So might as well be a good one. Lovely post, children learn more by observing their parents than they let on. And these are deep rooted ideologies, CW. We could make them or break them. My parents are a lot like yours .. We were taught more by examples than by words and so the lessons have stayed with us for life ! I think all of us were lucky that way. The ‘call centre’ generation are the ones who ruined it. You can always hope Afshan. The key is introspection and instinct. Keep both of them close. Absolutely! I hear so many parents who complain that their kids are always playing video games…um, why are you letting them?! EXACTLY Roshni! I think parents need parenting now toh..
Vinita, I was touched to read your post. It explains so beautifully why parents are considered a child’s first teachers. Our parents had such few resources, compared to us, and yet they raised us so well. I hope we can raise our children to understand the value of things that cannot be bought. Cynthia, you have no clue how happy this comment is making me. At times I thought I was the twisted one to think like that. I am so glad this post resonated with so many. What more can I say, loved your post, every single word of it. Parenting seems to be so hard, yet in that journey, we inch closer to perfection, if only to set an example for our children. Thanks Bhav. I am glad it struck a chord. Thank you Vinita for the post. I am lucky to have parents like yours. My mom used to tell me several stories and now i understand their meanings. Loved your post to the core. This was a great post on Parenting. We have a lot to face with our kids regards to peer pressure, FB, latest gadgets etc. I’m lucky to have very good parents who have worked hard to provide us the best and we’ve never been demanding. We were happy with whatever we had. Very nice post Vinita. Loved the story and the quotes your father passed on to you.